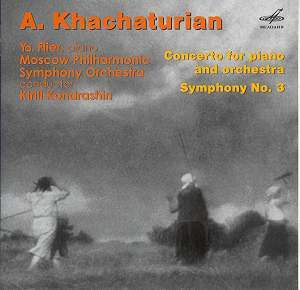 Who knows what Khachaturian thought of these recordings. However they were made during his lifetime and surely have some claim to authenticity - to reflect the sound the composer intended. While I confess that it may be a purely sentimental attachment it's pleasing to hear a Soviet orchestra in full flight. Yes, even in recordings between forty and fifty years old. There's a snarling vitality to the playing and to the recording. The piano is recorded with forbidding stony directness. If the violins can sometimes sound wiry it's nothing to worry about. The confidently forward woodwind and brass more than compensate. The Piano Concerto lacks the memorable content of the Violin Concerto yet its folk-oriental dynamism, quiet poetry and Stravinskian rhythmic attack make it a pleasure to hear. Parts of it surely recall the later populist-realism piano concertos of Krennikhov, Kabalevsky and Shostakovich; never mind such decorative-poetic non-Soviet masterpieces as Joseph Marx's Castelli Romana and de Falla's Nights in the Gardens of Spain - the latter memorably recorded by Russian pianist Alexander Iokheles. The transfers have been lovingly done although there is some rare shatter in the ultra-treble of the violins. Listen however to the hushed tear-drop fidelity of the Concerto's andante middle movement with its hints of Nights in the Gardens of … Yerevan. It rises to an indomitable climax at 7:30. The famous flexatone is very discreetly balanced. If the whirlingly excitable and headlong finale does not match the quality of the other two movements it is sold by the eager and furious Flier and Kondrashin for all it's worth. No half-measures here. The single movement Third Symphony was written, according to the composer, to express a feeling of happiness and pride of the Soviet People for their great Motherland. It's certainly imposing and we are left in no doubt of that from the tension-filled first few bars through to the colossal fanfares and the furiously sustained flying organ solo. Ossa is piled forbiddingly high on Pelion and it's a credit to Andrei Grosman and the quality of the analogue tape stock that the recording carries it so well. The central section of this 25 minute piece uses a melody close to the middle movement of the Violin Concerto and the Phrygia Adagio from Spartacus. After these pensive moments the tension and climactic-heroic material is mechanistically built like some massive engine (16:00 onwards) with a dynamic that vies with Shostakovich's Leningrad Symphony. Make no mistake this a work of thunderous bombast - a sort of echo of the Hollywood score spectacular. The Symphony was premiered in Leningrad on 13 December 1947 and had its Moscow first on 25 December. In both cases the conductor was Yevgeny Mravinsky. Authentic and gripping accounts of two of Khachaturian’s second rank works.